Hello so today I’m doing a Bulova 96A119 review. 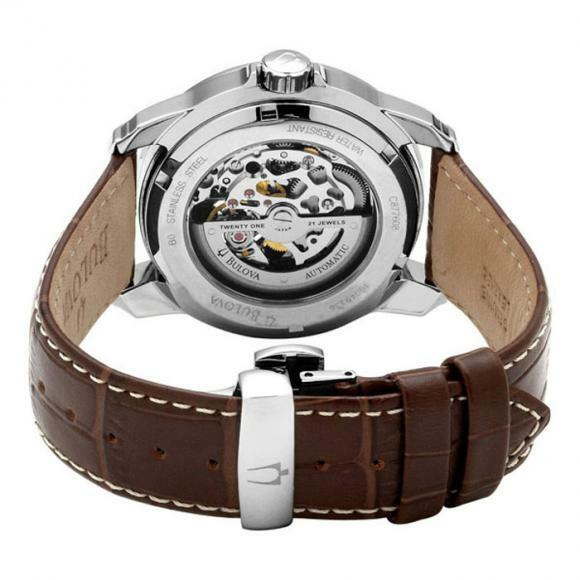 Finally I get to review a Bulova watch with my favorite type of clasp, the deployment on a leather strap. 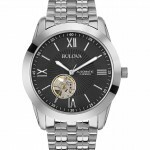 As you all are likely aware by now, Bulova is my favorite affordable watch brand. 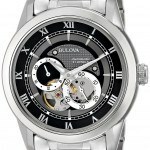 I’m going to plug my old article as always so do check out my top 10 Bulova watches to see what else they have in their collection. Anyway I’ll get on with my 96A120 review below and you can find it on Amazon, enjoy. When I first saw this Bulova 96A120 I thought, awesome look at that dial. It had a classy design with the exhibition windows that I love. I also then noticed that it featured a deployment clasp on the leather strap. These are my utmost favorite clasps to use and I’ve even specially bought them to adjust older watches in the past. 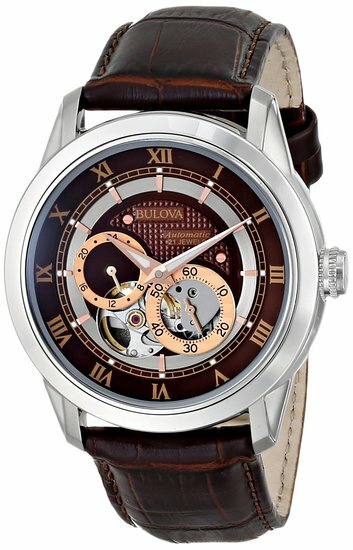 I like the design of the dial with the Roman numerals on the brown dial with the similar shaded leather strap. It really is quite a show piece of a watch. Hope you enjoy as we take a look into more details. The type of Glass they’ve gone for is a mineral glass. This is pretty much a medium hardness. The three main glasses you get are acrylic which isn’t too great, mineral which is specially hardened to resist scratches, then you get sapphire which has a hardness rating of 9. Obviously you shouldn’t expect sapphire glass at this price so the mineral is a good substitute. The case diameter is what I consider the minimum I would go for these days on a guys watch at 42mm. Most new watches are coming out this size these days, noticing the Daniel Wellington collection for instance. The thickness of the case is 11mm which is considered average so won’t sit overly huge on your wrist. They decided to go against having a date feature on the watch and I can understand why. With the exhibition case etc it’s hard to fit in the calendar at the normal 3 O’clock position so without putting the price up this would be hard to fit in. I’m quite happy without the date feature to be honest and I don’t think many people would really miss it. Deployment clasp! Yes finally I love these. All you have to do is push the two side buttons together and the watch nicely pops open. They are so easy to do and don’t require any fussing about which is perfect. The strap is made of genuine leather and is 22mm wide which is ideal for this size watch. The Bulova 96A120 has many of my favorite features. The exhibition case back, open aperture dial and the deployment clasp. It’s nice to get all these features together in an affordable watch. It’s work checking out my top 21 under £200 to see what else you can get for this sort of money as well. 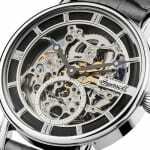 Hope you found this Bulova 96A120 review useful and enjoyable. You can buy this watch on Amazon.